It’s always a good idea to go to the source. And that’s exactly what La EspaÃ±ola is – the source of meats and supplies for many of the Los Angeles area’s Spanish restaurants. On Saturdays, to those who are willing to trek to Harbor City to get a taste, the reward is in the quality of food and low price. If you came for the ambiance, you’ve been misinformed. But if no-frills, no-nonsense paella is what you’re looking for, you’ve come to the right place. Office tables and chairs straight from the warehouse office supply are set up underneath tents so you can enjoy your paella – Juana and Frank themselves will make sure you have everything you need. Did you mention wine? Don’t fret – you can get a bottle straight from their very respectable and reasonable selection of wino (many of them Spanish, of course) starting with bottles as cheap as $4 to cork right alongside your meal. Maya of ShopEatSleep, Nancy of The Wanderkind and I joined a Sinosoul-organized event in which a total of no less than 25 people got together in the name of grubtastic Spanish seafood rice. And what a spectacular job he did. Also there were: Gourmet Pigs, Kungfood Panda, Diana Takes a Bite and Uncouthgourmands. Our meals were complimented by a value-added $8 meat and cheese plate – most of which is actually meats but is very good, with more than a couple types of chorizo sausage included. The olives that came with the plate were also very good. Oh right – the paella! It was so delicious. And while there was 3 of us (yes – girls), we really had to struggle to finish two plates, each of which cost $8.50. The pleasant surprise was that we got two different kinds – one had more scallops and the other had more mussels. A good number of mussels, sausage and prawns are in each assorted rice dish; added scallops or mussels made for their seafood variety. YUM! And might I mention – if you couldn’t already infer – it was a killer deal? Since we came with a lot of others, we got a “wholesale-wholesale” (is there such thing?) deal, but even if it were just the 3 of us it really would have only cost ~$12 per person inclusive of paella, meat & cheese plate and wine. Of course – the more expensive wine you get, the more the price goes up. This place is definitely worth the drive on any Saturday. And while you’re at it – why don’t you go ahead and call together a crowd? 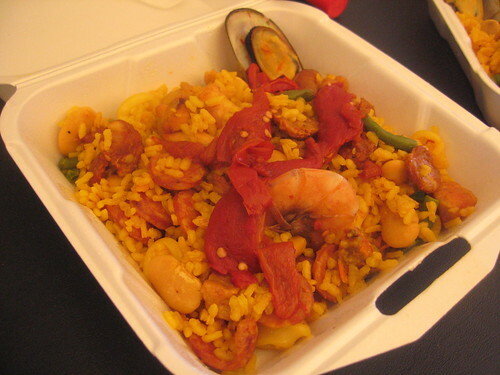 This entry was posted in Food, South Bay and tagged Harbor City, La EspaÃ±ola, paella, South Bay, Spanish, Spanish meats. Bookmark the permalink.